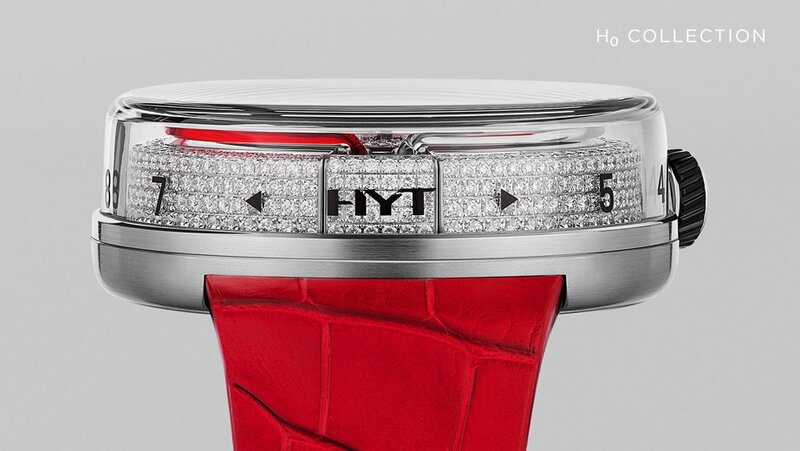 HYT was born from a dream to introduce fluid into the display of a mechanical watch and thus return the measurement of time to its very origins with the first water clocks that date back several thousand years. 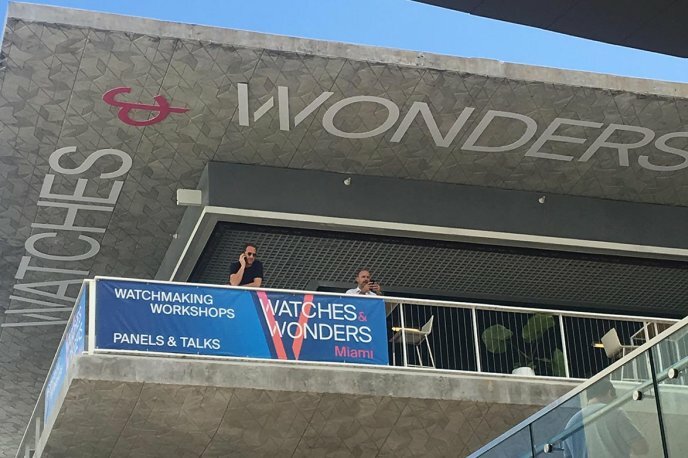 The project involved bringing together engineers, chemists and microtechnicians to work on finding a way not only of incorporating fluids into the time display of the watch, but also of connecting this display with the operation of a mechanical watch movement. After considerable research and development, the solution was presented in the form of a minuscule capillary tube in which two immiscible liquids were pushed around using a pair of bellows that are driven by the mechanical movement. 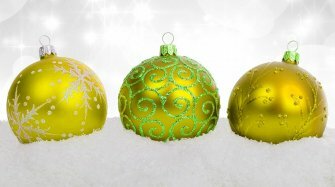 With one fluid transparent and the other one coloured, the meniscus between the two provided the reference point for indicating the hour. 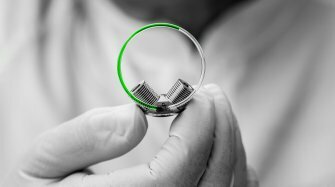 The scientists at HYT faced a number of challenges in pursuit of their goal, such as how to produce the capillary, how to coat the inside to ensure a smooth flow of the fluids, how to ensure the colour of the fluids remains stable over time and how to regulate the flow so that the correct time is displayed accurately. 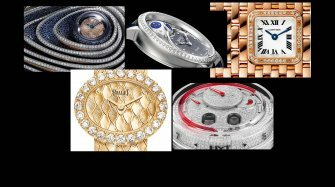 The resulting watches remain unique in the industry with their colourful fluidic time displays married with Swiss Made mechanical watch movements. 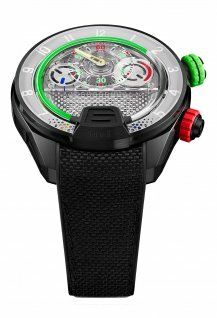 In its relatively short history, the HYT watch collection has demonstrated the flexibility of this technology with high-end models showing off the fine art of watchmaking, design-oriented models, a unique skull-shaped capillary and even a horizontal fluidic display. 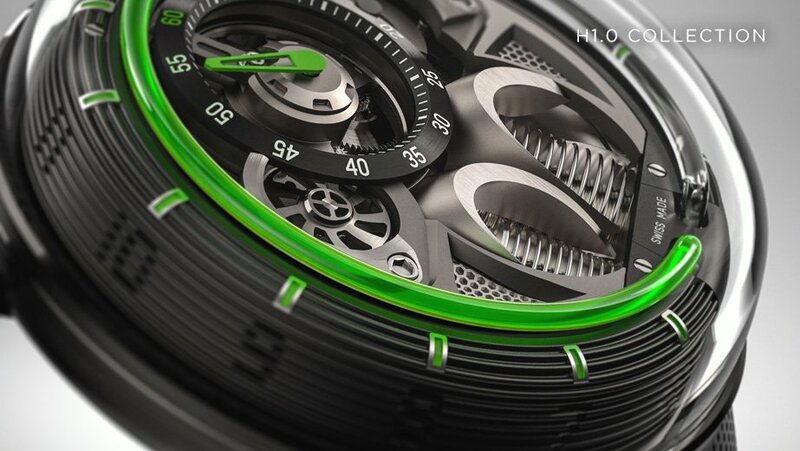 The initial idea of creating HYT and a fluid-display watch is first discussed. Launch of the H1, winner of the GPHG Grand Prix for Innovation the same year. 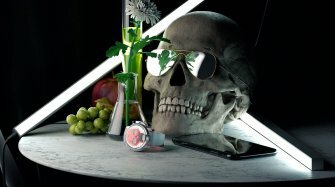 Launch of the Skull collection, with a capillary in the form of a skull, which encourages the wearer to contemplate his or her own mortality. Back to the roots with the H0 and a discreet dial covering all movement components with the exception of the HYT signature - the bellows. Launch of the H20 collection, whose design further accentuates the notion of fluidic time. 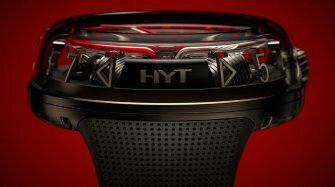 Having pioneered the use of cutting-edge fluids to display the hours in a wristwatch, HYT started to incorporate the notion of fluids into its designs. 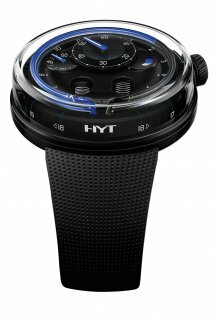 Taking inspiration from modern forms of displaying different aspects of time, from the universally understood progress bar on our computers to the activity trackers on our smart phones and the gauges in our cars, HYT strives for a way of displaying the time that is more intuitive than the rather abstract form that has dominated our clocks and watches for centuries. 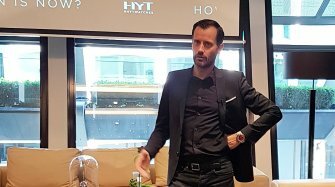 After all, such a unique and revolutionary technology as that developed by HYT requires an equally revolutionary means of expression. 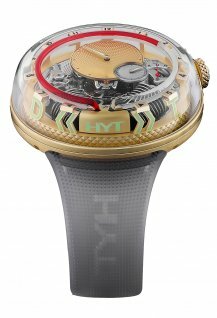 The H0 marked a rupture from existing HYT watch designs and a look back to the very origins of the fluidic time concept. 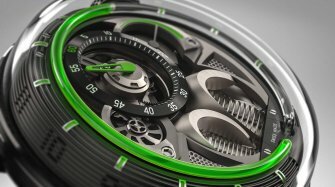 An understated dial hides all elements of the movement other than those unique to HYT – the two bellows – and places the emphasis on the brand’s signature time display element, the capillary, which can be viewed from above and from the side through a three-dimensional sapphire crystal. The new case design without lugs makes the H0 appear smaller than it actually is and ensures even better comfort on the wrist. 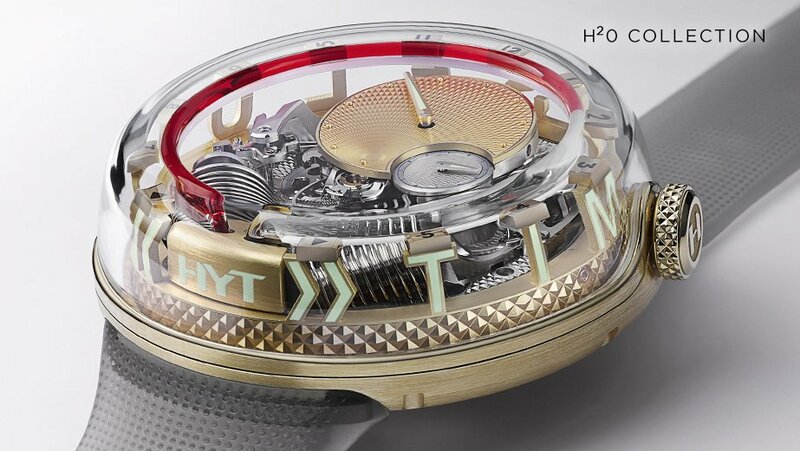 Launched in 2012, the H1 was the world’s first hybrid mechanical fluid watch. The hour of the day is indicated by the meniscus formed between two immiscible fluids moving through a tiny capillary tube. The minutes are displayed by conventional hands in a subdial at 12 o’clock. The entire system is driven by a mechanical hand-wound movement. The H1.0 takes an architectural approach to visualizing the passage of time. From the clearly visible power reserve display to the wheel that indicates the flow of the seconds, time is in perpetual motion. Positive energy emerges from a series of visible tensions, such as that between the steeply curved case and the clipped lines of the bellows. Even the side view of the watch tells the story of time’s passage with cut-out digits embedded in the deep grooves of the case. The H2 watch, developed in cooperation with Audemars Piguet Renaud & Papi, presented a new movement architecture with the bellows in a V formation, a sprung balance at 12 o’clock and a jumping minutes hand. The H20 builds on the concept of the more minimalist H0 but adds a more horological twist. The inner workings of the movement, including the bellows in the V shape, are laid bare and are visible through a dome-shaped sapphire crystal. 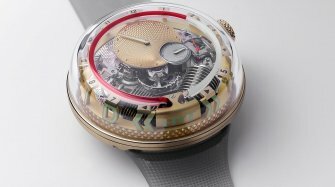 The H3, presented in 2015 as a limited edition of 15 watches, introduced a wealth of innovations: a rectangular case, a horizontal and retrograde display of the fluid for the hours (with the bellows and pistons working linearly and in opposition) and a linear and retrograde double articulated arm for the minutes. 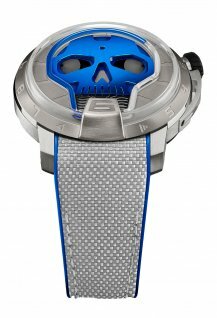 The H4 watches are skeletonized watches providing immersive views of the movement’s heart. The offset hours display appears on the bezel rather than the inner bezel ring. 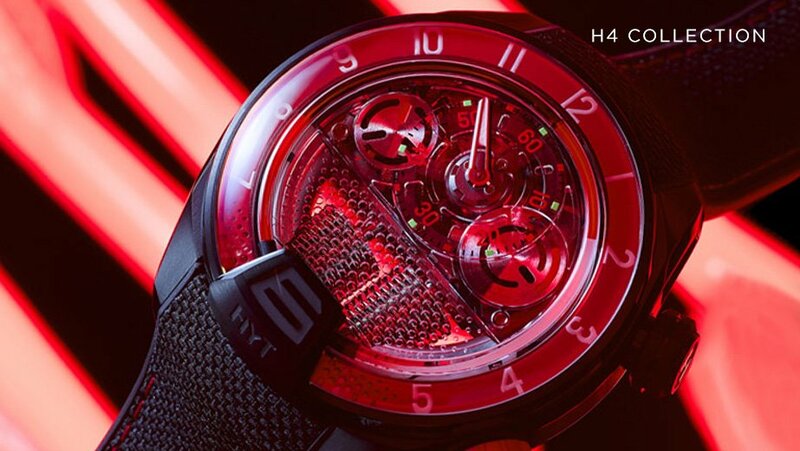 The H4 Gotham features a red fluid, while the H4 Alinghi and the H4 Metropolis feature a mechanical light source ensuring night-time visibility that is powered by a micro-generator that floods the dial in light for around 15 seconds when a dedicated pusher is pressed. 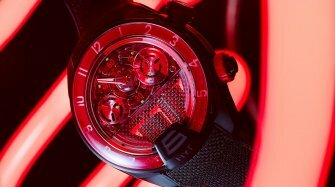 The provocative models in this collection take the complexity of HYT’s capillary even further, since it has the outline of a skull. 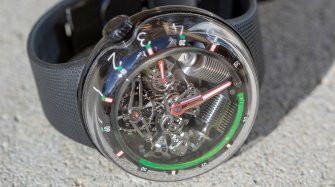 A choice of fluid colours in red, green or black flow through this angular outline, while the skull’s right eye houses the 65-hour power-reserve display and the left one shows the running seconds. The watch does entirely without minutes, instead offering a more “philosophical” view of time. 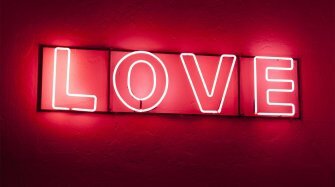 Three-dimensionality and reflection define the character of the H0 Time is Precious. 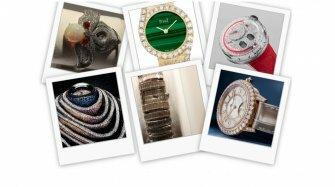 The Fondation de la Haute Horlogerie and 30 watch brands educated the American public and introduced their latest releases in the Miami Design District.